It’s Friday Fictioneers time, hosted by Rochelle. Here’s a rather silly story befitting quite a mad photo, which came to us from Lauren Moscato by way of Amy Reese. You’d think I’d have a million ideas for this photo, but no. Or perhaps the problem is that I have a million ideas but no decent ending. Here’s what I decided on in the end. To see this week’s other stories, click on the blue froggy. Sitting in their van, the builders watched as a dog shot out of the doggie door, pedalled its legs comically in mid-air and then crashed to the ground. “When he said ‘add a second storey’, d’ya think he meant ‘on the top’?” asked one. The door opened and a very irate owner stared out. We have a house with a door like that near us. I took a picture of it too. Someone told me that it is probably being used as a loading dock. I hope the people in the house know to back the truck up and not just step outside. It’s a long first step 🙂 Cute! I feel sorry for the dog! I’ve seen a picture of a house like that before on someone’s blog, I wonder if it was one you took? A loading dock makes sense, I hadn’t thought of that. I hope no dogs were harmed in the making of this story…fun read! This was great! LOL! Very funny Ali! Ha! Another smile! Thank you. Thanks, glad you enjoyed my silliness! You nailed it with both the voices & the timing. Very funny. Glad you liked it – I had to edit it quite a lot to get it to flow properly. Those crafty builders! Dominic Littlewood would have a go at them. I’m imagining him turning up at their place of business with his film crew and somebody from Trading Standards! It’s a silly photo and it deserves a silly story. I see we have come to the right place. Full belly Laugh! So stupid it’s hilarious! There are multiple levels of madness! Well, if the second story wasn’t specified to be above the first story in the contract, I’d say the homeowner would have a tough time suing the construction guys! Though they may want to watch out for a vicious limping dog…. Court action is nothing compared to the power of a seriously annoyed poodle. A dog, you hurt a dog? You do understand I take your stories as truth. Your the Doctor after all. Hey, that would be a great pick up line for you. It’s okay, the dog survived! You are = NOT your. Sorry! That is one grammar oops I don’t like. Yeah, the doggie’s okay. They’ll be long gone before the owner even works out what’s happened! 😦 I expect he survived. He’s a survivor! Could be a scene from Laurel and Hardy. Very funny. It is a bit slap-sticky! Glad you enjoyed it. One of our family friends blasted part of the hill next to their one-level home to build a garage, so the side door of the house was very high above the floor of this tall garage. Between the heights, the steps for this door being homemade, and the fact that they had retired police dogs who liked to greet people enthusiastically, I didn’t like to go there very often. Wow, you’ve seen a place like this 4realz! That does sound an ideal situation for getting rammed down the steps by a huge alsatian. I had to look up alsatian. They were very nice, but as part of their training in pre-retirement days, they only knew their commands in German or French. So “sit” and “stay” did nothing to thwart their energetic greetings. I’m imagining you running for your life, German dictionary in hand frantically leafing through the pages. Sorry, I just looked up “alsatian” and apparently it’s only used as a name for a German Shepherd in the UK. Live and learn! I think you did a great job on this story, and gave it the perfect ending, too! I’m glad you liked it, I had a lot of trouble with the ending. It is a pretty strange-looking house, isn’t it? Haha, that was funny–after I read in the comments that no dog was harmed. BTW sit in German is sitz, and sounds almost the same. My dog is bilingual. I can confirm that the dog was fine, if a little annoyed! Sounds like a clever dog you have. funny. But just not for the dog. No, the dog was quite annoyed by his tumble. That was brilliant! Very funny. Dodgy builders!! Owner stands in the doorway, shaking his fist in impotent fury… That’s a great ending, loved it. Thanks, it took a few rewrites to get there. I’m glad I got there in the end! Definitely a laugh out loud one! I thought it was fitting given the photo! I’m glad you liked it! 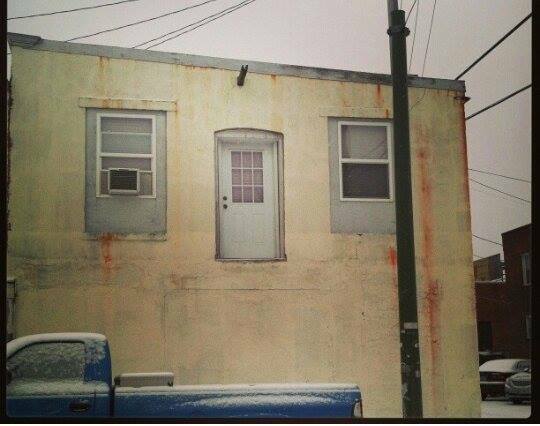 This is nowhere near the worst that dodgy builders have done. At least they finished the work (a set of stairs wasn’t in the plans, after all!). Hilarious. This is a great take and you came up with an excellent ending! I struggled with that, too. Indeed, this place looks like some kind of mistake. It’s hard to imagine what the purpose of the door is, though some others have suggested a loading dock for a high truck, or a walkway long since demolished. I’m glad you enjoyed it! Very funny. A great visual. Always read the small print. Your story is a real antidote to Grand Designs! Love that daft doggie – and that people are so concerned about him! Now that will be one irate customer! And one very unhappy dog …. We’ll be embarking on a building project this year. I’ll steer clear of this mob. Very funny story. Yes, I would. I don’t think this is the first time they’ve messed things up! Oops! I’m sure the dog was surprised 😛 Funny one, doc. I can’t help wondering how they added a second story from the bottom. I guess mine is not to reason why, mine is but to laugh. (I never said I was good at rhyming.) Glad the pooch is okay. You’re the first person to mention that! I have a vague image of them hoisting it up with a big crane with the owner asleep inside 🙂 They could have been amazing builders if they weren’t a bit crazy. Very funny stuff this week. Glad you liked it! The silly-looking house has brought out quite a few funny stories. It sounds as though you’ve worked in the trades. You captured the sound and lingo perfectly, as well as the ‘Did we get paid? Then we’re out of here’ attitude. A great piece. Always get paid up front, that’s my motto. Glad you liked it!